SAP Machine Learning: Wheres the Beef? Welcome! Where’s the beef is an 80’s catch phrase (fast food advertisement) that is synonymous today with lack of substance or detail. The what and where of machine learning to date has been easy to comprehend but the how (e.g. how can algorithms learn from data without having to be explicitly programmed or what technologies support machine learning?) has been intangible. The details behind algorithms will be left for another day, the realization behind technologies that can irreversibly alter the fabric of economies and 1industry strategies is worth looking into further. Under pinning SAP’s strategy helping customers increase productivity by enabling the workforce to focus on higher value tasks and driving down repetitive tasks through automation is the Intelligent Enterprise. Comprised of 3 components the Intelligent Enterprise is uniquely positioned to deliver a framework that shares end to end integration, industry expertise and embedded intelligence. The Intelligent Suite delivers intelligence across the value chain with intelligent applications for every line of business, this includes industries (25) and countries (180+) all supported by S/4HANA. Each line of business delivers extended capability and outcome by application as shown (fig. 1). A formidable line of business portfolio delivers next practices to our customers. Aging enterprise landscapes are under pressure; business, devices, social media is generating an overwhelming amount of data (structured and unstructured) creating unique challenges and new opportunities. How to manage data from any source, in any format and rapidly develop, integrate, and extend business applications with an open digital platform? How to improve productivity, innovate while still running today’s business? How to get actionable insight from external data sources to respond faster to customer needs and competitive threats? Satisfy demand for a more purposeful work environment with new workforce skills? As a core component of the Intelligent Enterprise Digital Platforms modernizes back-end systems and delivers to the enterprise data-driven intelligence and innovation. 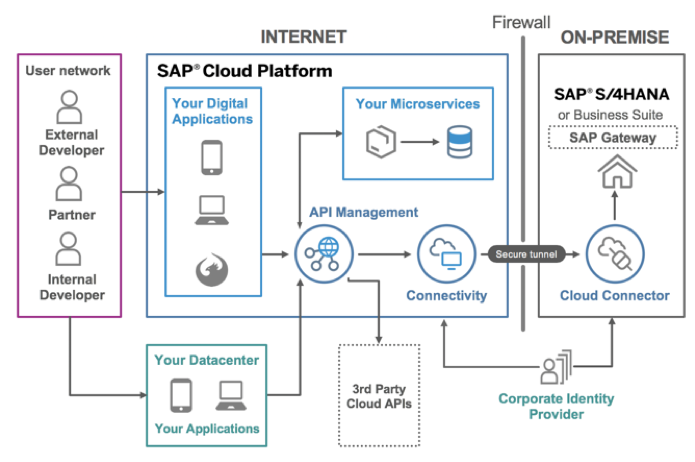 The SAP Digital Platform is not one single platform it is a combination of platforms with many supporting applications and capabilities more information here. 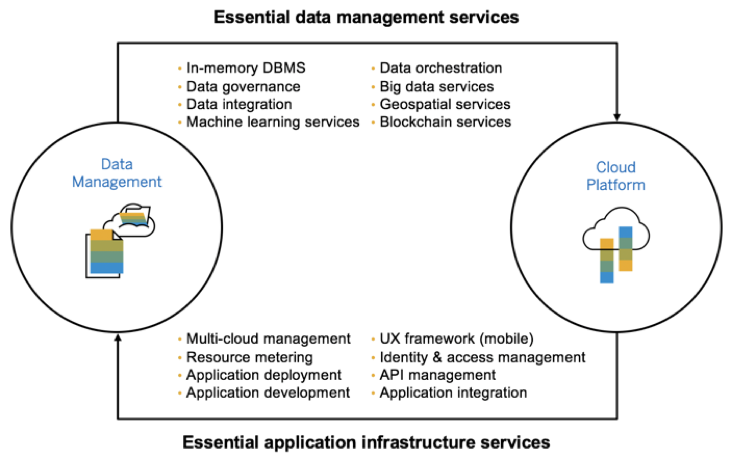 Combining the management, governance and availability of data across platforms and systems helps generate innovative services on the SAP Cloud Platform. Leverage SAP Cloud Platform development tools to build custom apps. Intelligent Technologies depend on large amounts of enterprise data generated by core applications residing within various systems and many customers use different solutions that focus on providing analytical results based on this data. With intelligent applications embedded into core applications, business processes now have the ability to smartly utilize enterprise data as training data for the implementation of Machine Learning services. Businesses are learning and evolving from historical data and training models are helping drive down the use of repetitive tasks through automation (Fig. 7, 8). As you can imagine the individual technologies and applications supporting Machine Learning is extensive, below are main application frameworks. 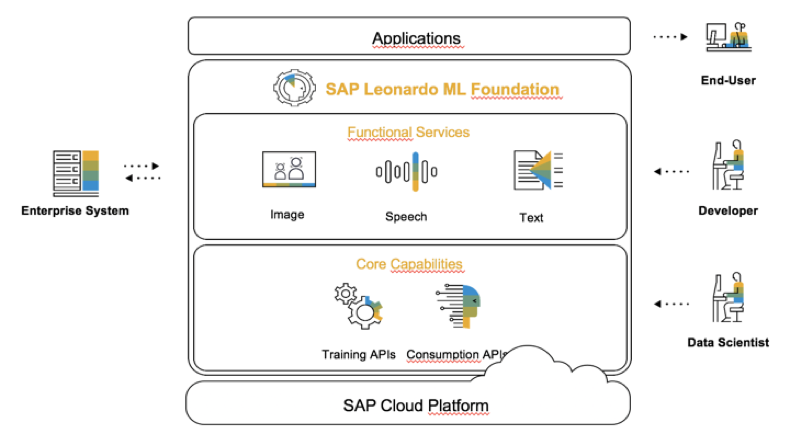 (a) The SAP Leonardo Machine Learning Foundation is aimed at solving the issue of how by providing an enterprise-grade platform for Machine Learning in the cloud by unlocking valuable insights from structured and unstructured data using machine learning technology. With the help of easy-to-use APIs, you can use the foundation to enable intelligent enterprise applications, key benefits here (see fig. 9). 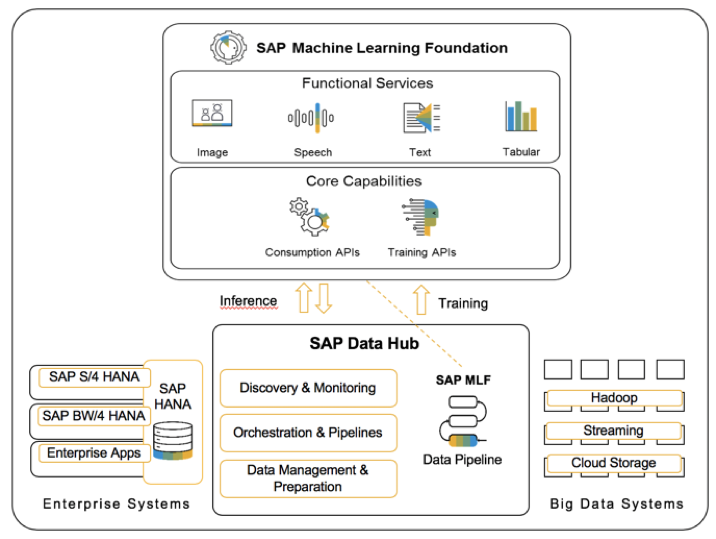 Key Message: SAP ML Foundation is a toolbox of intelligent technologies, micro-services and data management tools (core components) residing on the SAP Cloud Platform that are the basic building blocks required to quickly and easily enrich applications (bring or deploy your own model, create new machine learning services i.e. out of the box and co-innovation). Technology: Machine learning technology can be quickly incorporated into existing SAP or non-SAP solutions using the Machine Learning services provided by SAP Leonardo Machine Learning. Functional Services: Exploit a variety of data types covering image, speech, text and time-series data. E.g. detect objects in images, detect keywords in text or predict time series data. Enterprise System: Connect to and integrate with enterprise systems (e.g. via CP connector or SAP DataHub), e.g. S/4HANA or SAP HANA DB. innovate rapidly on a cloud platform with machine learning, big data, Internet of Things technologies simplify building applications to solve existing or new business problems. 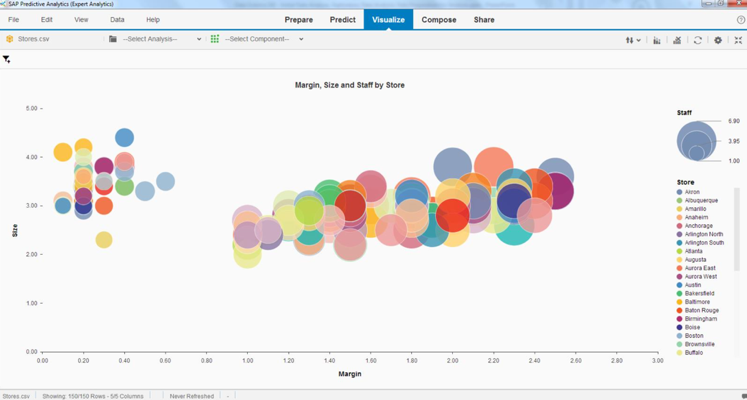 Numerous predictive and visualization charts available with Lumira. 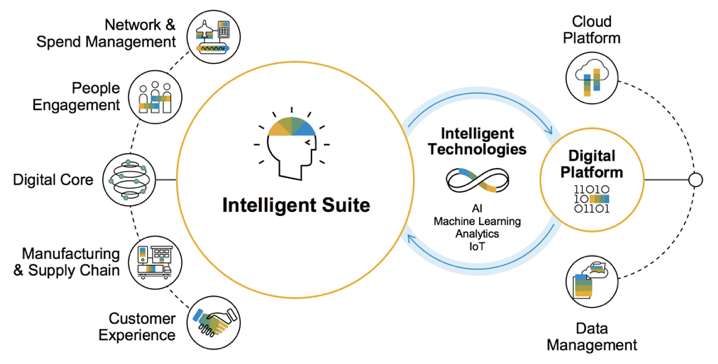 I hope you enjoyed this blog and are able to articulate how the Intelligent Enterprise supports AI/ML in a data-driven economy.